High-level waste (HLW) created due to the use of nuclear reactors has been identified as a major issue globally. Unlike industrial waste, the hazards associated with nuclear waste, such as its radioactivity, do weaken with time. The used nuclear fuel left after it has spent over 3 years in reactors, generating heat to produce electricity, is the most significant HLW produced during nuclear generation. A majority of nuclear waste management strategies are therefore targeted at disposing of high-level waste. Transparency Market Research (TMR) finds that HLW accounted for the dominant share of 35.9% in the global nuclear waste management market in 2015. However, nuclear waste management requires high initial cost and has high payback period, which are inhibiting its growth trajectory to an extent. Nevertheless, the implementation of stringent government regulations aimed at curbing harmful emissions will boost opportunities for the market in the near future. TMR forecasts the global nuclear waste management market to reach US$5,627.5 mn by 2024, rising at a CAGR of 16.7% between 2016 and 2024. The market stood at US$1,382 mn in 2016. Globally, the demand for waste management services is expected to be the highest from pressurized water reactors. Boiling water reactors are likely to exhibit the second highest demand for nuclear waste management in the global market. In 2015, the pressurized water reactors segment led the global nuclear waste management market holding a dominant share of 69.3%. Likewise, the demand for nuclear waste management in boiling water reactors is also expected to rise in the forthcoming years. These reactors operate in lower fuel temperature and require lower pressure compared to pressurized water reactors. The boiling water reactors segment is thus poised to exhibit a greater CAGR than pressurized water reactors. Regionally, North America, Asia Pacific, and Europe constitute the most lucrative markets for nuclear waste management. Currently, Europe exhibits the highest opportunities for nuclear waste management, followed by Asia Pacific. Both these regions together have more number of nuclear reactors, thereby contributing significantly to the mounting concern of nuclear waste. This is expected to give major impetus to the nuclear waste management market in the regions. Europe held a share of 41.3% in the global market in 2015. The increasing investments in nuclear power projects in the region are expected to boost opportunities for nuclear waste management further in Europe. The prospects for the market in North America however are expected to remain moderate due to the shale gas boom witnessed in the region. With China planning to double its nuclear capacity by 2020, Asia Pacific is expected to emerge as the one of the most lucrative regions for enterprises operating in the global market. Growth opportunities for nuclear waste management in Asia Pacific are likely to exceed than that exhibited by Europe by 2024 due to the increasing investment in planner nuclear projects in the region. Growth witnessed by the market in Rest of the World was sluggish in 2015. The presence of developing or economically unstable countries limits the growth of the nuclear waste management market in Rest of the World. 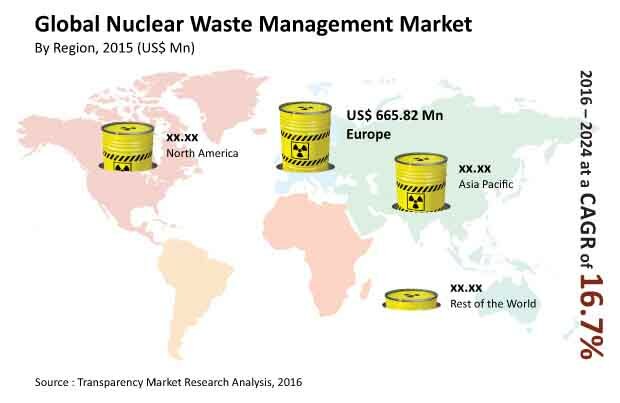 The global nuclear waste management market is led by companies such as Areva SA, Veolia Environment Services, Bechtel Corporation, US Ecology, Inc., Augean Plc., and others. This research study analyzes the nuclear waste management market in terms of revenue (US$ Mn). The nuclear waste management market has been segmented on the basis of waste type, nuclear reactor type, and geography. The regional segments have been further divided into 12 sub-segments that comprise nine countries which are major players in the global nuclear waste management market. For the research, 2015 has been taken as the base year while all forecasts have been given for the 2016–2024 period. Market data for all the segments has been provided at the regional as well as country-specific level for the 2014–2024 period. The report provides a broad competitive analysis of companies engaged in nuclear waste management services. The report also includes the key market dynamics such as drivers, restraints, and opportunities affecting the global nuclear waste management market. These market dynamics were analyzed in detail and are illustrated in the report with the help of supporting graphs and tables. The report also provides a comprehensive analysis of the global nuclear waste management market with the help of Porter’s Five Forces model. This analysis helps in understanding the five major forces that affect the market structure and profitability of the global nuclear waste management market. The forces analyzed are the bargaining power of buyers, bargaining power of suppliers, threat of new entrants, threat of substitutes, and degree of competition. The report provides detailed insights into the nuclear waste management business globally. There are currently numerous drivers for the nuclear waste management market. One of the most prominent drivers is the stringent norms and regulations to reduce harmful emissions globally, mandating higher investments in nuclear power projects. Apart from this, nuclear waste management market would benefit from several planned nuclear decommissioning projects. Market attractiveness analysis was carried out for the nuclear waste management market on the basis of geography. Market attractiveness was estimated on the basis of common parameters that directly impact the market in different regions. The nuclear waste management market has been segmented in terms of waste type, nuclear reactor type and geography. By waste type, the nuclear waste management market has been segmented into low level waste, intermediate level waste, and high level waste. By nuclear reactor type, the market has been segmented into boiling water reactors, gas cooled reactors, pressurized water reactors, pressurized heavy water reactors, and others. The nuclear waste management market was analyzed across four geographies: North America, Europe, Asia Pacific, and Rest of the World. Europe, held the largest market share (41.3%), followed by Asia Pacific (30.1%) in 2015. Rising awareness about the need for nuclear power and huge investments in nuclear power projects are the primary drivers for the nuclear waste management market in Europe. The market in Rest of the World experienced sluggish growth in 2015. Regional data has been provided for each sub-segment of the nuclear waste management market. Key market participants in the nuclear waste management market include Areva SA, Augean Plc, Bechtel Corporation, BHI Energy, Perma-Fix Environmental Services, Inc., Swedish Nuclear Fuel and Waste Management Co., Stericycle, Inc., US Ecology, Inc., Veolia Environmental Services, and Waste Control Specialists, LLC.